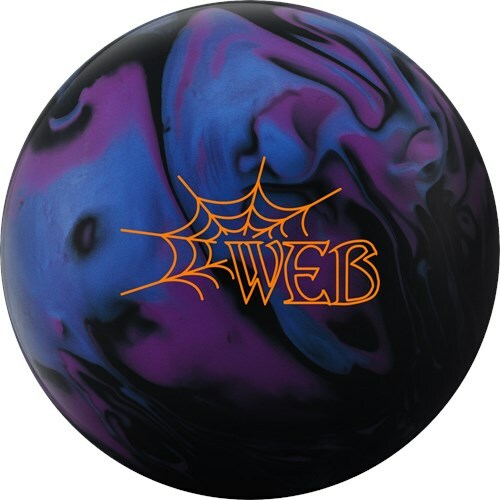 The Hammer Web bowling ball takes the highly successful Aggression Hybrid coverstock and pairs it with the ever popular Spheroid core. This combination allows the ball to have a strong mid lane reaction and then gives a heavy roll off the backend when the lanes have a medium to heavy oil condition. This bowling ball is Carbon Fiber Infused! Carbon fiber is one of the toughest materials on earth. Hammer decided to add this material to the inner core of this ball for added strength and durability allowing them to offer an incredible 3 year warranty. The Web is a great compliment to the Web Tour. When you need something that is a little more responsive at the break point compared to the Web Tour, you will not go wrong with the Web. The Spheroid Core from the Rhodman Pearl continues to deliver! Anyone bowling league on a normal house pattern should get this ball! Return on investment will be instant! All I can say is "Wow". The Hammer Web is another special piece. This ball is clean through the heads but really strong through the mids and backend. It has a strong defined move off the friction and hits like a truck. I can use this ball on most medium to medium heavy conditions with confidence that it will always make a strong move towards the pocket. And the carry...is second to none. The ball pairs nicely with the Web Tour and provide a great one-two punch out of your bag. If you are looking to quickly fill your arsenal with really good pieces, get the Web and Web Tour as soon as possible. You won't be disappointed. Likes: I laid this ball out since it already is more angular than the Web Tour by design with pin above ring finger and kicked out cg. This is one of my favorite layouts to use. The result was a longer and stronger on the backend version of the Web Tour. It is such a great compliment to the Web Tour. The modified core in the Web series is something else. I love how low this ball keeps the pins for me and the way it kicks the pins around on the deck. The perfect compliment to the Web Tour when you want to open your angles a bit and still retain the corner ability downlane. Likes: This ball is amazing!!! I can scoot it down lane easily with an incredible predictable back end. I find it very versatile on medium and on long patterns. I have mine drilled pin up and have used it on a variety of patterns. When I needed that little extra in the back, this ball did not let me down. Likes: I went with Dual Layout 55 x 5 1/2 x 40 Pin Up no hole. Great ball through the fronts and strong angular back end off of the pattern. I used abralon 2000 with VISE Slip Agent. Dislikes: You need oil off course, but the cover is very flexible with the abralon pad and polish. This hybrid ball is so strong off the spot. So if the lanes are a little dry side. You need to ball down to our Hammer Pearl balls for the next step in your bag.